SeTool is another powerful device for read, write, unlock and upgrade Sony Ericsson, Lg and few Samsung smart phones. Like other flashing boxes: UFS3, z3x this particular box is unique because the interface is easier to work with but a little mistake can kill your phone. Download the file FARManager for accessing cid49 from my folder. Now first we need to patch the MAIN for making it compatible with FarManager. Unrar it to your chosen destination. For this download Phone-XS beta 2.01 from my folder. Enter settings as shown. 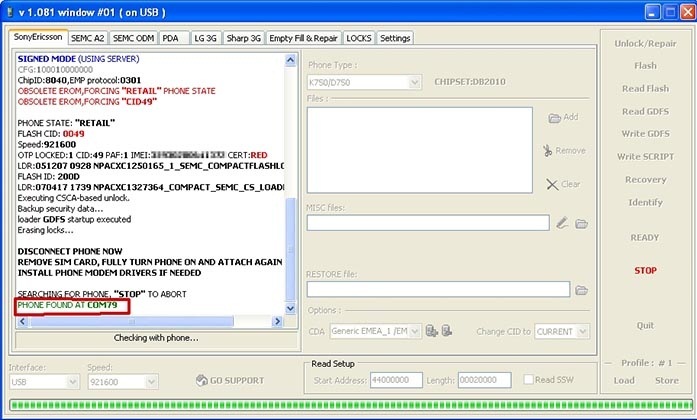 To Converting k750i to w800i It should either be CID49 or CID36. Select only if your phone is cid49 as this tutorial is for cid49 phones only which it would be probably if its not more than 1 year old. Now close PhoneXS. Unplug the phone.Re-insert the battery to refresh the phone. A box will appear and the 2nd last option would be named S.E.F.PPlugin.Select it. NOW BE VERY CAREFUL ON THE NEXT SCREEN.SELECT Device:DCU60, Speed: 921600, Boot Script: (According to phone model) k750_w800_CID49. Hit enter the matrix. Connect your phone according to the instructions After a few seconds two folders by the nameFLASH andFS will be shown on the left side .On the right side you can see your hard-drive contents. Please you can ask question.